Who invented the Light Bulb? The name of the person credited with inventing the first practical incandescent light bulb is Thomas Alva Edison (1847 - 1931). Thomas Edison is not only famous as the American inventor of the Light Bulb but also as a designer, businessman and entrepreneur. When was the Light Bulb invented? Thomas Edison invented the first commercially viable Light Bulb in 1879, during the Second US Industrial Revolution period of invention (1850 - 1914), just two years after his invention of the Phonograph. Definition of the Light Bulb: The Light Bulb is defined as a light-emitting device that works by incandescence consisting of a glass bulb containing a wire filament that emits light when heated and used inside electric light fixtures. The electric light bulb is made in a wide range of sizes, wattages, and voltages. Fact 1: Who invented the Light Bulb? The first practical incandescent Light Bulb was invented by Thomas Edison in 1879 during the Second US Industrial Revolution era of inventions (1850 - 1914) which was a foremost addition to advancements made in the area of Technology. Fact 2: Who invented the Light Bulb? Many other notable people contributed to the development of the incandescent light bulb including Alessandro Volta, Humphrey Davy, Joseph Swan, Charles Francis Brush, Henry Woodward and Matthew Evans. Fact 3: Who invented the Light Bulb? In 1800 Italian inventor Alessandro Volta (1745 - 1827) developed the first practical method of generating electricity by his battery called the voltaic pile. Volta's use of glowing copper wire is considered as one of the earliest forms of incandescent light. Fact 4: Who invented the Light Bulb? In 1802 the British inventor Humphrey Davy (1778 - 1829) produced the world's first electric lamp by connecting voltaic piles to charcoal electrodes. Fact 5: Who invented the Light Bulb? In 1850 Joseph Swan, the British inventor and chemist developed a cost effective light bulb using cheap carbonized paper filaments instead of expensive platinum filaments. Fact 6: Who invented the Light Bulb? American inventor, Charles Francis Brush (1849 - 1929) a pioneer in the commercial development of Electricity developed an electric arc lighting system powered by his invention of dynamos (electric generators) that would later be used by Thomas Edison to power his electric lights. 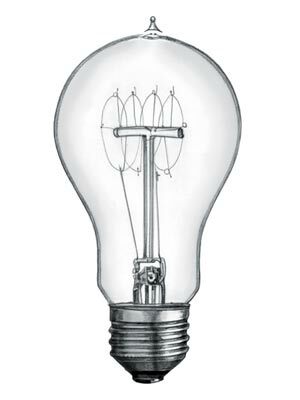 Fact 7: Who invented the Light Bulb? In 1874, two Canadian inventors Henry Woodward and Matthew Evans discovered the principle of incandescent electric lighting and patented an electric light on August 29, 1876 (Patent number 181,613). Woodward and Evans failed to commercialize their electric light bulb and eventually sold their patent to Edison in 1879. Fact 8: Who invented the Light Bulb? Thomas Edison is therefore credited as the inventor of the first commercially viable and practical incandescent light bulb. Fact 9: Who invented the Light Bulb? Thomas Edison was a prolific inventor who was galvanized to such an extent that he was destined to become notable as the American inventor of the Light Bulb and many other items. Fact 10: Who invented the Light Bulb? Thomas Edison, was born on February 11, 1847 in Milan, Ohio, United States and died on October 18, 1931. Fact 11: Who invented the Light Bulb? The early years of Thomas Alva Edison were spent in Milan, Ohio, United States and later in Michigan where he was raised by his family. His father Samuel worked in the ship building industry and his mother Nancy was a school teacher. Fact 12: Who invented the Light Bulb? As a young man he worked with the Grand Trunk Railroad and in 1859 was given permission to set up his own chemistry lab. Fact 13: Who invented the Light Bulb? Thomas Edison briefly attended the Cooper Union for the Advancement of Science and Art in New York City's East Village but he primarily self educated after receiving an excellent education at home, tutored by his mother, where he gained his passion for science and chemistry. Fact 14: Who invented the Light Bulb? The American Civil War (1861 - 1865) erupted bring chaos to the United States and young Thomas Edison worked as a wire operator with Western Union, fascinated by the Telegraph and Morse Code that had been invented by Samuel Morse in 1838. The ever inquisitive Thomas Edison began experimenting with various telegraph instruments. Fact 15: Who invented the Light Bulb? The end of the American Civil War heralded the Second US Industrial Revolution, also known as the Technological Revolution, that centered on new inventions related to Steel, Oil and Electricity. The new 'Age of Technology' resulted in numerous inventions so it is no surprise that Thomas Edison became an inventor. Fact 16: Who invented the Light Bulb? In 1867 he was employed by the American Telegraph Works and the Automatic Telegraph Company to develop a functional automatic telegraphy system. Fact 17: Who invented the Light Bulb? In 1868 Thomas Edison invented applied for a patent on an automatic vote recorder. It was the first of his many inventions. He decided to become a full time inventor in 1870 and opened his business in Menlo Park, New Jersey where he met his wife Mary Stillwell. Fact 18: Who invented the Light Bulb? Thomas Edison and Mary Stillwell were married on December 25, 1871 and the couple had three children. Mary sadly died in 1884. Fact 19: Who invented the Light Bulb? Thomas Edison went on to invent a new telegraph system for Western Union in 1874 and the carbon transmitter for the telephone in 1877. In the same year, 1877, Thomas Edison invented the Phonograph. Fact 20: Who invented the Light Bulb? In 1878 Thomas Edison and his team of researchers in the laboratory in Menlo Park began testing numerous designs to establish the longest burning filament for light bulbs. In 1879 he purchased the patent filed by Henry Woodward and Matthew Evans for their invention of the electric light bulb. Fact 22: Who invented the Light Bulb? The Thomas Edison incandescent light bulb became a huge success and in 1880 he founded the Edison Electric Illuminating Company of New York that, financially backed by banker J.P.Morgan, constructed electric powered generating stations to power electricity and the light bulbs. His first power station was on Pearl Street in Manhattan, New York. The African American inventor Lewis Howard Latimer, invented the carbon filament in 1881 that improved the newly-invented incandescent light bulb. Fact 23: Who invented the Light Bulb? The 39-year-old Thomas Edison married the 20-year-old Mina Miller (1865–1947) in Akron, Ohio and Mina and Thomas went on to have three children together. Fact 24: Who invented the Light Bulb? In 1892 Thomas Edison merged his electric company with The Thomson-Houston Company to form General Electric. Fact 25: Who invented the Light Bulb? Thomas Edison died on October 18, 1931 in his home, "Glenmont" in Llewellyn Park in West Orange, New Jersey. The cause of death was due to complications of diabetes. Fact 25: Who invented the Fluorescent Light Bulb? The fluorescent Light bulb was invented in 1934 by the American inventor Arthur Compton.